Parking is located behind the restaurant. Access is from Agua Fria street, just across from Our Lady of Guadalupe Church. Chef Joseph Wrede is a Food & Wine Best New Chef, the winner of several AAA Four Diamond Awards, several DiRoNA Awards and has received both Wine Spectator and Wine Enthusiast distinctions. Joseph’s Culinary Pub is a creation of Chef Wrede and his creative and business partners. 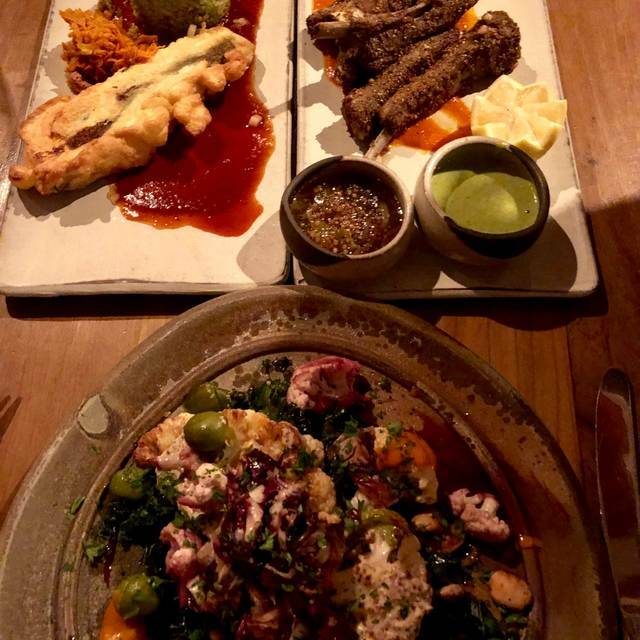 This is the third incarnation of Wrede’s original Joseph’s Table, conceived in Taos, New Mexico, not quite 20 years ago, for which he is well known and loved within the region and beyond. Joseph’s Culinary Pub is designed to be a platform for Chef Wrede’s unique and uncompromising vision on traditional and contemporary cuisine, both regional and international. Regarding the restaurant as a process much like theater, Wrede envisions the experience of dining in his restaurant as an interactive play between the pub and the public, with his sights aimed at rivaling high art. Mixed Greens, Toasted Pumpkin Seeds Roasted Beets, Sweet Peppers, Pickled Onions & Truffle Vinaigrette. Butter Lettuce, Roasted Bell Peppers, Marcona Almonds, Orange Supremes, Green Olives, Feta & Fresh Oregano Vinaigrette. Thai Style Cabbage. House Made Yogurt. Roasted Root Vegetables, Cardamom Espresso Dusted Phyllo. Sherry Beurre Blanc. I haven't been here in awhile and so glad to return, Joseph is consistent in that the cuisine is always superb. 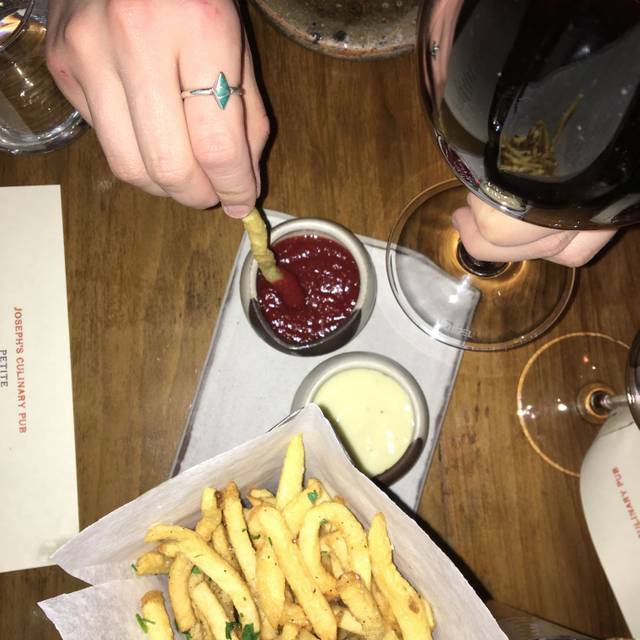 Do not miss the duck fat fried fries, incredibly delicious. The bison short ribs were outstanding and I'm usually not a big fan of that cut of meat. The dish was perfectly prepared and the accompanying sauce elevated the experience. My companion had the lamb burger, which is her favorite there. I'm not doing the dish justice but she certainly wasn't disappointed. The deserts were well executed and delicious as well. 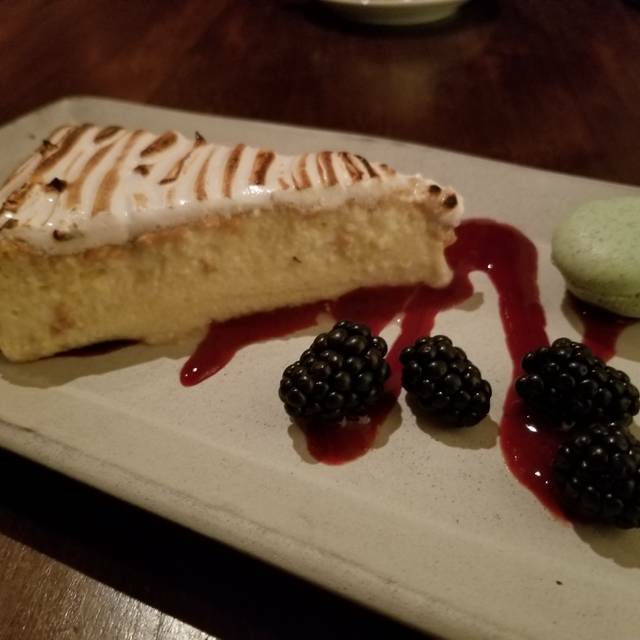 I couldn't end this without mentioning the staff, they are true professionals and knowledgeable about the restaurant's food and beverage offerings- they are stellar. I don't know how this place faded off my radar, but I won't make that error again! While some of the food was excellent, my companion had a side salad which consisted only of greens, served atop a very hot plate. Not good. Also the bread, small very white rolls, was insipid. That said, when they get it right, it's very good. I appreciated that they were able to nicely accommodate my vegan diet. Loved Joseph’s. Great food and service. Joseph's has been a go too. But not this trip.. Menu listed duck confit--which is made by cooking duck in duck fat until the skin is crispy. My dish should have been named long, slow cooked. It had the texture of pot roast or slow cooked lamb shank. You couldn't taste the duck anyway because it an overpowering sauce on it. My guests said their dishes wer "pretty good." It was a downer for me. The restaurant is normally pleasantly quiet. It was unbelievably noisy this time. The halibut portions were too small for the price. The spinach and asparagus portions were too small for the price. We asked for extra spinach when ordering and they didn’t honor the request. Not the best meal I’ve had there. Always a fantastic meal and service at Joseph's. Wish I lived a bit closer! Our food was remarkable and our server, Sogaru, was friendly, efficient and nade our dining experience an evening to remember. A wonderful restaurant, if a bit on the pricey side. But I can't really complain since everything was go good. From the service, to the decor, to the delicious food, all were top notch. And they do have a "pub menu" with several more reasonably priced entrees. The wine list is interesting, and while there are a few lower priced bottles, the bulk of the list starts at $50-$60. 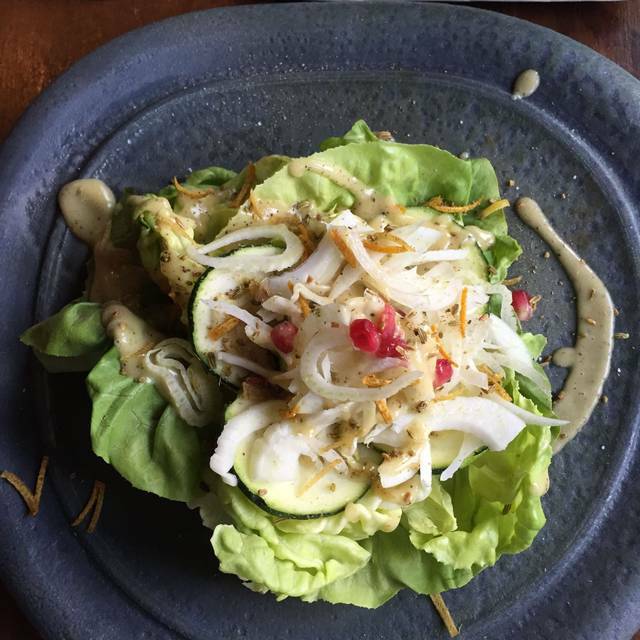 This is undoubtedly one of Santa Fe's best restaurants, and a little off the beaten path from downtown. Looking forward to going back! This was our second time to Josephs. The first time was magical. This time, awesome-but not so magical. Reviewing this second adventure, I would have to say -we brought our 23 year old son with us. Enough said. 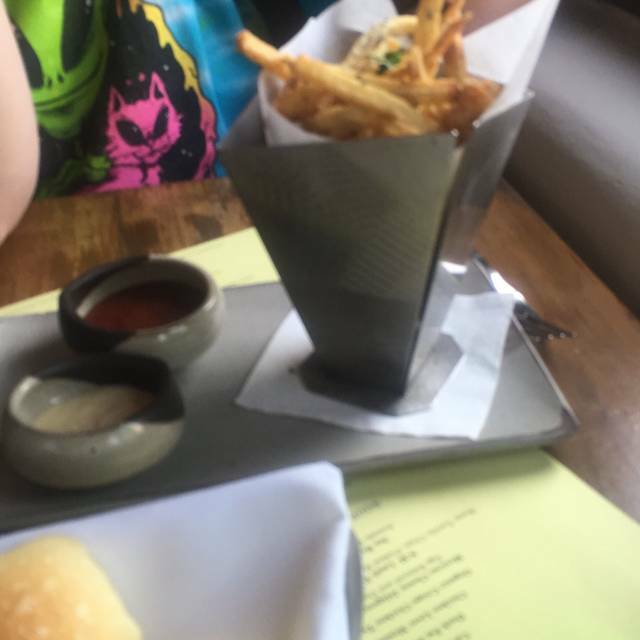 My wife and son both had the same item from the pub menu. 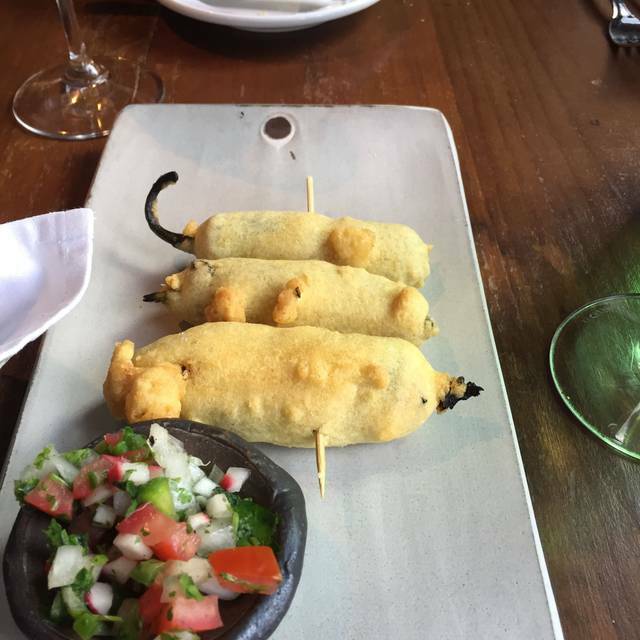 Chile Rellenos. Good, filling-breading as good as usual. Just something wonderful missing, that I guess -we had come to expect. I had the meatloaf and it was good. The polenta was dried on the plate, probably from waiting for the main item. Once again-good, just that Josephs pizzaz went missing. Salty too. The Living salad was great. The service was good. The bottle of beer, was good. I would venture back again and again. Miss the Longmire appetizer. Im thinking the menu could use an overhaul. Do not want to sound critical, just trying to be helpful. This opinion was shared by all. The best experience I have had in 10 yrs living here at a restaurant! Highly recommended to all!! We always have liked the meatloaf, on this visit it was very dry and unpleasant. The menu sounded wonderful but the execution of most dishes was considerably less so. The pate was the exception. The cod with potato crust was underdone and the crust over done and the bar blanc sauce was bland. The meatloaf was very dry and could have benefitted from more of the tomato sauce. The lamb burger was also overdone and the fries very salty. The trio of sorbets were all very strange - much better served between courses than as a dessert. Food had no flavor. Super sad as we have lived Joseph’s in the past. It's a beautiful space with very kind, knowledgable, and professional staff. We enjoyed the food so much! It was an exquisite yet down to earth evening, perfect for celebrating our friend's birthday. Compliments to the chef and to the entire team!! We will definitely be back soon. Thank you very much! Best restaurant meal we have had in quite awhile.....imaginative and delicious!!! Thank you!! Fantastic food, the burger was delicious! The carrot and crab soup was amazing as well, the 1/2 duck was outstanding as well. This is a lovely restaurant. It has nice interiors, commodious seating arrangements - cozy but not on top of each other and a noise level that works if you want to talk. There is also a parking lot which in Santa Fe on busy evenings is very desirable. Good wine list. Their pairing of ingredients is very good. Three of us shared the tuna poke appetizer. The lamb burger was delicious. Two of us had that and substituted duck fat fries and onion rings instead of the side salad for a slight up-charge. Totally worth it. The onion rings are outstanding. I would go sit at the bar and just order a drink and those rings. 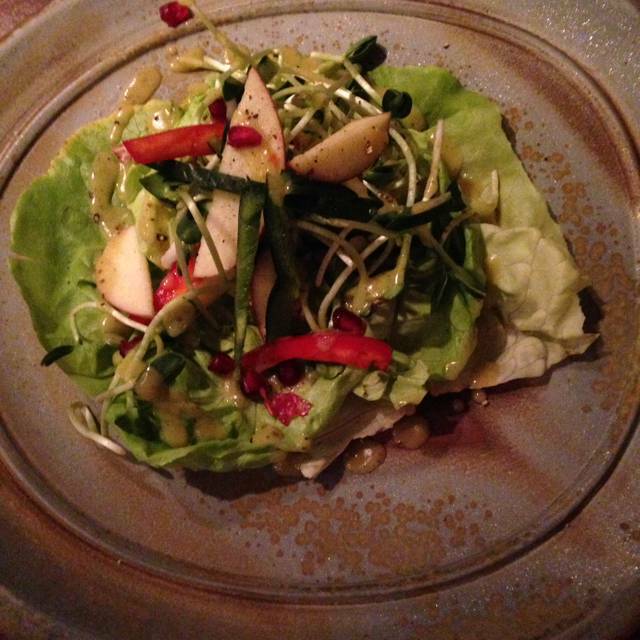 We also shared the pepita, beet, avocado salad with truffle vinaigrette which was also very tasty. They have nice dinner rolls as well. We were too full to have dessert, which was too bad as the desserts all looked good. A charming place, was welcomed as a single diner and made to feel at home. The waiter Greg was attentive and helpful and made it nice to be there. I ordered the chicken and the brick, and it was just too much chicken...loved the spinach and leeks that came with it, but the chicken was a fairly large piece of white meat..would have enjoyed more vegetables and less protein. The after dinner tea was, I think, Apples to Oranges and delicious, just the thing to linger in the nice comfortable spot. The menu is very creative -- lots of interesting appetizers as well as main courses. Our waitress was very helpful in explaining the dishes and making recommendations for pairing food with wine or beer. The potatoes fried in duck fat were a flavorful treat to start the meal. The curry carrot and crab soup, and the pepita, beet and avocado salad were both generously portioned and delicious appetizers. The Abuelita Nora's pollo chicken tomatillo posole verde, vegetarian enchilada, and cumin crusted lamb rib chops were tasty and filling. We shared the homemade sorbets for dessert: grapefruit with tarragon, orange with basil, and lemon with thyme. The flavor combinations were interesting, some more successful than others. The restaurant was quiet, and the service was prompt. I will definitely come back again! Was not very impressed with the food as the portions were overwhelmingly large and flavors were too rich. There Could be a better balance with the richness by adding freshness. Though, the service was excellent and the ambiance very cozy. I would only recommend for coffee and desert as that was our favorite part of the meal. WOW. Joseph's was incredible. 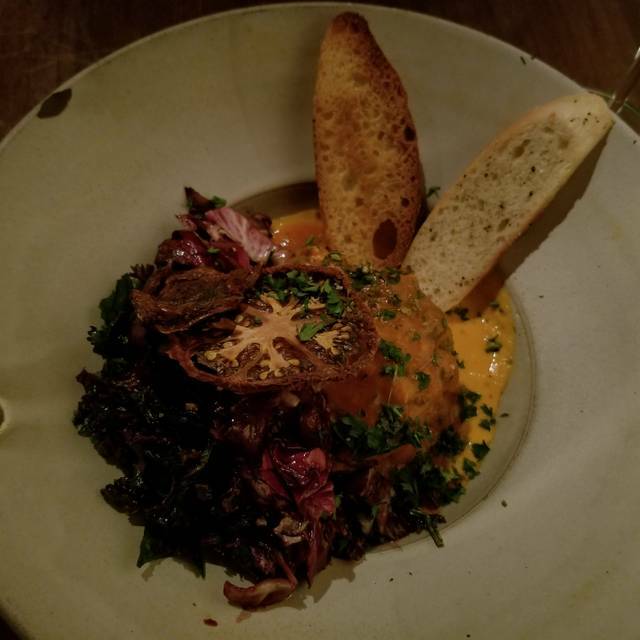 The rabbit lasagna was revolutionary, and the food was amazing. Great ambiance, great food, great wine, and an overall exceptional experience. We had never been here and it was just delicious. Our server was amazing. The food was innovative and very good. it was the end of restaurant week, so there was a set menu, so I want to go back and try some more of their choices. Lovely meal in an intimate setting. A memorable meal of creative deliciousness. Knowledgeable, friendly staff; appealing presentations; in a charming, comfortable setting. The menu was uninspired and they were out of the only interesting main dish. Apparently others agree with me. I ordered the fish of the day which was tasteless and served fried, not crusted as per the description, and came with ketchup! My date had the meatloaf which was tasty but his onion rings were not crispy. Sad. The server asked how our food was before we had a chance to try it and did not return until it looked like we were finished and did not ask how everything was. I would have politely told her. We were able to tell a busser who was very gracious. Our server was great when she was around. Food always excellent. This time we also had a great recommendation for a bottle of wine. The wine list is expensive so seek out the waiter's recommendations. Again, the tuna tartare appetizer cannot be beat, though the chicken liver mousse was delicious, too. Unusual rabbit lasagna, not sure I would order it again. Steak very good though a medium rare order was more medium than rare (it was Restaurant Week so the kitchen was very busy). Can't beat the butterscotch pudding -- like nothing you've ever had. Homemade ice creams very good, too. For a special occasion this place is perfect. Casual setting and in Santa Fe anything goes as far as dress code! Excellent deal for restaurant week and the meals were. Excellent. The table was in a very dark area and required a cell phone light to read the menu. A small table lamp would be a big help for fading eyeless!! Superb server and food. We had a wonderful dinner, food was delicious. Starr, the manager always treats us like loyalty. We just love this place!!!! We did enjoy our experience at Joseph's. This was our first time to eat there. Everything was excellent---except the noise level. We could not hear each other.....which made the evening a bit miserable in terms of fellowship.....want to return on a "quieter" evening. Went during Restaurant Week, so the price for my really delicious meal / wine was excellent. The atmosphere is warm and inviting, and I like that the tables aren't crammed side by side. However, that did not keep it from being so noisy that my friend and I had to almost shout across a small table to hear each other. This is a common problem in Santa Fe with restaurant interiors being echo chambers constructed of stone and plaster, made worse by clueless diners who forget how to use their "indoor voice." I will recommend Joseph's for mid-week meals, not at prime time, and not during Restaurant Week! Food was wonderful and well presented. Gabe, our waiter, was very friendly and treated us well. Great dining experience. Joseph's is always a great experience. The food, service and ambiance is wonderful. I highly recommend. We took our best friend for her special birthday. Sadly food was only OK. We finished the meal and left with a “let down” feeling. Maybe restaurant staff was exhausted, it was Restaurant Week. Next time we will sit at the bar and order appetizers from bar menu.